A winner of China’s National Violin Competition in 1984, violinist Danwen Jiang has concertized extensively as a concerto soloist and recitalist throughout North America, Europe and Asia, and has performed at world renowned concert venues such as Carnegie Hall, Kennedy Center for the Performing Arts in Washington D.C., La Salle Gaveau in Paris, Beijing Concert Hall, and the Hong Kong Cultural Centre Concert Hall. She has appeared at international music festivals such as Festival du Quercy Blanc and Festival Dan le Gard in France, InterHarmony International Music Festival in Germany and Italy, Harpa International Music Academy in Iceland, Victoria International Music Festival in Canada, Rutgers SummerFest, Sanibel Chamber Music Festival, Yale Chamber Music Series as well as the Manchester Music Festival where she has been an anchor faculty artist since 1993. As an avid chamber musician, she has performed with distinguished musicians including members of the Guarneri, Juilliard, Tokyo, Emerson and Shanghai String Quartets, The Chamber Music Society of Lincoln Center, American Chamber Players, and Soloists of the Pacific Rim as well as violinist Menahem Breuer, cellist Nathaniel Rosen, pianist Andre-Michel Schub, clarinetist Stanley Druker, harpsichordist Igor Kipnis, and Jazz violinist Regina Carter. Her latest CD of Debussy, Frank and Ravel sonatas for violin and piano with pianist Walter Cosand, released in 2012 by Soundset Recordings was described as "Absolutely exquisite" by the Fanfare Magazine. Her performances can also be heard on public radio networks in the United States, Canada and China as well as on Eroica Classical Recordings and China Record Corporation. 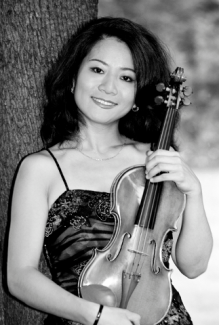 A recipient of the Professor of the Year Special Recognition Award (2012), President’s Tenured faculty Exemplar Award (2008) and the Distinguished Teaching Award (2005) at Arizona State University, Jiang’s international reputation as an exceptional performer and teacher yields her frequent invitations to perform and present guest master classes at distinguished music institutions around the world, including the Central Conservatory of Music in Beijing, Iceland Academy of the Arts and College of Music in Reykjavík, the State University of Music and Performing Arts Stuttgart in Germany, Vancouver Academy of Music in Canada, Sydney Conservatorium in Australia, and major universities across the United States. She has been a featured concerto soloist and master class clinician for violin at the 2005 and 2008 American String Teachers Association National Conferences. Prior to joining the ASU School of Music faculty, Jiang taught at Oberlin Conservatory of Music and the University of Illinois. Her students have been winners of national and international violin and chamber music competitions in the United States, China and Europe. Many of her former students have embarked on high powered positions such as concertmasters for the Illinois Symphony Orchestra, Reno Philharmonic Orchestra, Reno Chamber Orchestra, Nevada Opera Orchestra and the Symphony of the Southwest in Arizona, Associate Professor of Violin at Western Illinois University, members of the Julstrom String Quartet, Vinca String Quartet, Tetra String Quartet who are currently Faculty Associates at Arizona State University School of Music, among other performing and teaching positions across the United States and abroad. Danwen Jiang studied violin with Arnold Steinhardt, Oscar Shumsky, Taras Gabora and Weijian Zhao. Additional teachers and chamber music coaches include Joseph Gingold, Felix Galimir, Alexander Schneider, Jaime Laredo and Michael Tree. Ms. Jiang performs on a 1727 Antonio Stradivarius violin (the "ex-Ries").